It snowed all weekend. If it had been 5 degrees colder there would be enormous drifts of snow. Our temperature hovered at 35, however, so the lovely large flakes the floated by the window, hit the warm, soggy ground, creating a muddy mess. It was a great Sunday to sit around, watch television and cook comfort food. 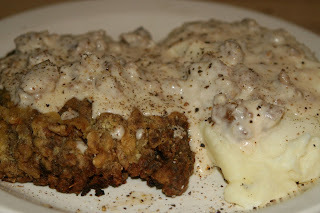 In the "great minds think alike" vein, when I turned on my computer this morning, my first e-mail was from Saveur touting the joys of chicken fried steak. 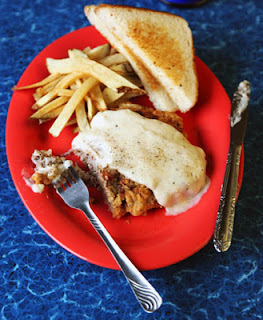 Their chicken fried steak looked like this. Not bad. Mine, however, went the for the double comfort of fluffy mashed potatoes and a sausage gravy. Just the mention of chicken fried steak makes my mouth water. It was one of Bill's best delights on our last trip to the US to finally experience this delicacy for himself.